"Evidently, also fewer Americans opted to load up on gold and/or silver Eagle coins last year. The Treasury Department’s US Mint reported full year 2012 gold coin sales down by 25% from 2011 and silver coin sales down 15% from the previous year. The 753,000 ounces of gold Eagle coin sales were the lowest reported sales figures from the US Mint since 2007." Just wondering if he is actually correct in saying this ? I've had a quick hack around the US Mint site , but can't find the info. Any help would be very much appreciated - thanks. Stay as far away from them as you are able for if you let them attach themselves onto your life support systems, they will bleed you both financially and emotionally to death. The banking and investment financial crash was the result of lawyers working their magic in concert with their banking clients, no matter where you find the stinking rotting carcass of a bad deal, the trail will quite often lead back to the lawyers. The chaos of the recent financial crash will only be resolved 20 years from now involving even more lawyer minutia with more and more financial costs, pain and suffering for just the common folks who are ignorant of the law that they are constantly reminded is supposed to be protecting them. Lawyers do not produce anything, they are a net drag on the economy. Most lawyers (not all) are lazy and not worth your money hiring because they do not do their homework, and when they get around to preparing for a case it is usually last minute and near the deadline. When you go to trial they are not prepared, because they are lazy and have not allowed themselves sufficient time in library, they however can be very good at the dance, which often occurs in front of the judge. The lawyer that can dance the best beyond the bar in front of his audience the jury and of course the judge often prevails at the hearing. Why is this? because no one is prepared, not even the judge. These things I have experienced first hand, which is why 20 years ago I made a promise to myself that I would stay as far away from deals that might tend to get me into legal problems, that if I did happen to get myself into some kind of legal can of worms, that I would take the time to educate myself in the language and letter of the law in an attempt to keep any lawyer that I might have to hire on task of what I need them to do for me. No more blind fool in the courtroom at the mercy of a system designed to chew a man up and spit him out all because the man did not know what in the hell was going on at the hearing. If you find yourself snagged in the legal system, have a lawyer, or are going to need to interview a lawyer to hire to help you with your case, I highly recommend that you take all the time you need in the law library, find a pro se groups who most times will be happy to help you, find other sources online that can help educate you on what you need to do to win your case. Interview lawyers to find out how much they understand the case law that you have studied on your own, find out how well the lawyer dances in the courtroom, find a lawyer who understands that you are a fully informed litigant in the law and your are hiring them to put on their dance at the hearing. Many lawyers will show you their door quick, keep interviewing, pro se knows who the lawyers are that understand your expectation of them. Keep at it, it gets easier easier by the hearing. Bitter? embarrassed? you bet I am, though not the least bit shy to tell of my experiences to others in hopes of encouraging a resolution to others caught in the deadly webs which lawyers spin. AG dropped from 21 to 8. Many sold out, but the believers purchased more. Not because of blind faith or greed, but because they were aware of the real picture. Markets being irrational for longer than one can stay liquid? The Racketeers count on it every time. A wise man once told me "Watch what the big boys do". Well, what are they doing? Answer....They are hoarding tangible assets. The instant gratification, race to compete for useless crap, desire to impress friends, family, and even complete strangers is engrained in the majority of our shallow population. There are leaders in the world, and there are followers. Followers rarely excel. Everybody here dedicates a portion of their valuable time to contribute and learn from this site for a reason. Some are currently making the tough transition from follower to independent thinker. Most here have made the journey. More and more are making the decision to. It's a difficult one, as the criminals have purposely designed it to be. Moving against the grain and driving into the headwinds takes effort, diligence, and faith, but becomes less tiring when one is convinced that the effort has merit and benefit. The traveler evaluates, weighs and prioritizes these benefits. The shift in mindset has begun. Those who lack initiative and effort rarely excel. No doubt many sleep better at night than many of us do, however, and as many of us are aware, these folks sell themselves short, as they will never realize their true potential as leaders, educators, or human beings. We gather here, not just because we thirst for wealth, but because we thirst for knowledge. TFMR is but one door....a door our host has graciously opened for the thirsty to enter and drink. There are dozens of doors to walk through within these walls...all which give us the opportunity to continue our awakening, and to gain strength while facing the headwinds. Folks here should submit guestpostings to ease the stress and grind our host faces. Perhaps our Host or Mods can choose one or two. The daily technicals and important news will never be lost, as members of the community will ensure we all stay informed. Our block is filled with other awakened households who offer gifts of knowledge, encouragement, and insight. Our desire for awakening over the last few years is not just for our benefit. Those we love and desire to keep safe and healthy in mind and spirit will have the opportunity to enter these doors, and the doors of other homes in the neighborhood. This is, in part, the reward for our efforts. Nothing New Under The Sun, Katie ! People, including my own mother, said I was bad seed .... and this was way ........... before GMO seeds were invented ? Rising private sector debt pushes up asset values (banks lend more and people bid up housing etc.) until there is no greater fool to borrow more left and things collapse. Falling demand leads to falling prices and deleveraging. This falling demand reduces economic activity and leads to rising unemployment, leading to a spiral of falling demand and deflation. In the Great Depression government spending rose as did government debts via deficit spending to compensate for loss of private sector demand during the deleveraging process. In 2008 the same thing happened (to a much greater extent), deficit spending continues despite a wobble over the fiscal cliff. Prof Keen has an interesting blog on why the government should probably keep deficit funding going in the western world for longer. He does not mention new money creation or the intervention of central banks in manipulating down interest rates, buoying asset prices and equity markets but it is worth a read nonetheless. Despite some private sector debt recovery the consumer is tapped out. 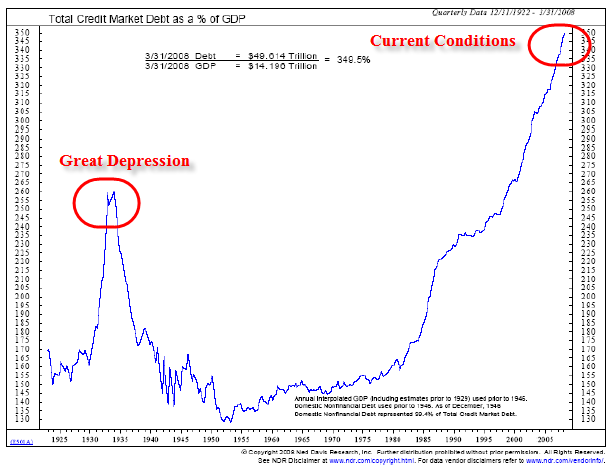 All the confidence tricks from the central banks cannot stimulate demand for borrowing what one cannot afford. I would also question how far debt to tax income / debt:GDP of countries can go before currency confidence evaporates especially when this is occurring with direct monetization (who else will buy our bonds?). I believe TPTB is trying to engineer a recovery by aggressively devaluing western currencies and debts whilst supporting asset and depressing commodity prices through 'market interventions'. This may be a race between an inflation driven recovery (true inflation not fiddled figures) and loss of confidence in the dollar as a reserve currency. Deflation must be avoided at all costs. What ultimately rekindled GDP growth a decade after the Great Depression was WW2, perhaps that is where we are heading by 2018 if things haven't improved by then. If I could hat tip your post more than once I would! Maintaining sanity while dealing with an insane system. From my own experiences, I can say that on more than one occasion, I've felt lost and as if everything I was doing was meaningless in the face of such financial corruption and my inability to wake people up. I'm talking about some pretty significant despair. I wondered if this was what drowning felt like. Fortunately, I found your site, and other sites where I could get a dose of sanity. That really helped ground me. I realized that you cannot awaken those who do not wish to awaken. I also came to realize that the best I could personally do was to opt out of the insanity and continue to stack. The beast will kill itself. I can help by taking silver out of the system, and that will hasten the demise of the beast, but in the end I believe that through it's own actions, the beast will ensure its' own downfall. Never doubt that you bring tremendous value to the table. For people such as myself, this is the place I come to for a dose of sanity when I feel overwhelmed by the insanity of present day corruption, in which nothing makes sense. You have my sincere thanks, as do the other members who come here to post. When I get past the frustration stage, I realize that there is a positive side to this thing dragging on and taking longer to be resolved than I thought it would take. When the cart finally tips over, more people are going to know why it tipped over. This last point will be crucial for a better restart. Enough of all that... The most important thing I wanted to say was thank you! I apologize for not making clear what I was asking about. It wasn't the disease you addressed, it is the mushroom known as the "silver bullet". Thank you for the education on the other chaga :). is a mushroom with a high anti-oxidant content.............making it pretty useful and benefitial, specially if its growing all around u.
Astaxanthin is the strongest anti-oxidant however. Chaga, chaga over to the new thread, folks. Submitted by philipat on January 4, 2013 - 6:47pm. "I can no longer promise her that it will get bigger one day"
The red pill makes one aware of the importance of having a stack while the blue pill makes stacks and their size irrelevant. At least I think that's it. then you may get some sense of where ivars is coming from. 1. He is stating that our predicament is the nature of money itself, as debt. 2. You are complaining that within the existing system there has been overwhelming fraud. You are both correct but are discussing at cross purposes and completely missing what the other is saying. Here is an article you may find of interest. It's about a Danish pig farmer who noticed an improvement in his pigs within two days of switching to a GMO-free diet. Results included elimination of diarrhea, more piglets born per sow, stronger healthier piglets, elimination of birth defects, reduction of medicinal use by two-thirds, reduction of labor and increased profits. Everything I read on GMOs seems to indicate that Europeans are far more aware of the dangers involved than we in the U.S. I'll probably repost this is the new thread, but since it is a response to Turd's post on this thread I'll put it here first. In personal news, my job situation has improved a little. I won't go into to too many boring details, but I do want to say that the company I work for has a tendency to get rid of people right around Christmas. It has happened at least three times in the seven years I've been working there. That I made it to 2013 is a positive. Also, the man who initially put me on notice has exhibited an better attitude toward me. He is also increasing my responsibilities at the same time that my productivity is increasing. I still canceled the dental work I had planned on getting done in December and January because the money I set aside might still be needed for things like rent and food should everything come unglued. We shall see. But, back to Turd's slightly maudlin post. I am actually encouraged by it. People who have been reading my comments here know that I am an anarcho-capitalist. I don't try to hide it, but I also try to keep it on-topic and try to avoid acrimonious squabbling about it. That being said, it is often after disgust and even anger about the way things are turns out to be the final impetus. Because now that I know that the CFTC is negligent and corrupt and only serving to protect and defend their TBTF overlords, my hope is gone. And, again, I'm not talking about hope for a resolution to the metals manipulation, I'm talking about hope that the entire western political and economic system really isn't as corrupt and narcissistic as it seems. It is as "corrupt and narcissistic as it seems." It has always been so, but it was always well hidden, at least for those who didn't want to see it. The 20th Century, especially, was one lie after another, but the liars are losing their hold. There are too many alternate sources of news and information. People aren't buying it any more and TPTB are starting to take the gloves off. They are getting desperate and trying every trick in the book in hopes of putting the genie back in the bottle. And they are failing. They are losing the faith and trust of too many good people. So hang in their Mr. Mayor. Get mad, stay mad and press on. The folks who live in Ancapistan have gotten here by many different roads. I heartily recommend you--and everyone else here--read Power and Market: Government and the Economy, by Murray Rothbard. If you can read that and still think that the state is anything but the greatest threat to civilization and social order there is nothing I or anyone else can say. Thank you VERY kindly for that post about your goats & the deer, Katie ..... That helped me with my current depression & gave me hope for recovery of my own sanity & spirit-of-joy. What i am to explain now is what i have been thinking for quite a while, i never posted it because it is pointless and i will probably be labeled a disinformation agent or something like that. about 4 years ago i started thinking i should change my money into gold and silver. I doubted for about 2 years, and then, 2 years ago i did it. At that time i decided it was a long, long term decision. I am happy i have thought about this and made the desision myself without influence from any sites like this. Because honestly, every time i read this site, i start to doubt the whole thing. Not just in down times like now, but always. It is because i have some build-in system in me that opposes and alarms when people are trying to manipulate my thinking. It makes me think the opposite. And this system reacts very strongly on this site. The way the community reacts to anyone who dares to express any doubts, the aluminum hat mentality that gets extremer with the day. When i read this site, i feel like some people are gonna end up in an asylum someday soon. And at those times i need to remember myself that it was my uninfluenced choise to buy PMs. If that choise was influenced by this site, i would probably have sold them already or be in an asylum myself.